It is simply not true that everyone sends texts. Not everyone has a cellphone that can perform that function. Not everyone with a cellphone is communicating via text. But that fact would be hard to prove by going anywhere in a crowd, where one can see seemingly everyone using their cellphone, and a great flurry of thumb-dialing taking place as one person communicates to another via text. Although it might seem that texting is the modern-day phone call, texting is not quite as prevalent as one might think. For financial providers and advisors, it is not even standard operating procedure. Regulations mandate that advisors maintain a record of all communications with clients, and texts are notoriously difficult to keep a record of. While it is possible, and financial firms do it to comply with regulations, it is not as simple a task as printing out emails. So, while investors may want to be allowed to text their financial advisor for specific investment concerns, those advisors may not be in a position to text back with anything substantive. Advisors who invite investors to text them must make investors understand the compliance issues that might prevent them from texting back. Federal regulators have taken texting more seriously as a communication concern. Financial provider firms must have strict guidelines in regards to the texting activities of their advisors, while maintaining that form of communication open to investors, who are not violating any rules by sending an initial text. The Financial Industry Regulatory Authority and the Securities and Exchange Commission require that a record be kept of all electronic communications by advisors. That includes text messages. The rules also state that electronic communications are supervised so that no electronic communication can occur without at least two people within the firm aware of the conversation. These rules do not prohibit texting as a messaging platform. But, as texting becomes more prevalent and can come from so many different sources (some social media sites, for instance, allow for messages to be sent to cell phones), firms must be overly diligent and far-reaching in their compliance methods and strategies. There are more ways to contact an advisor today than ever before. 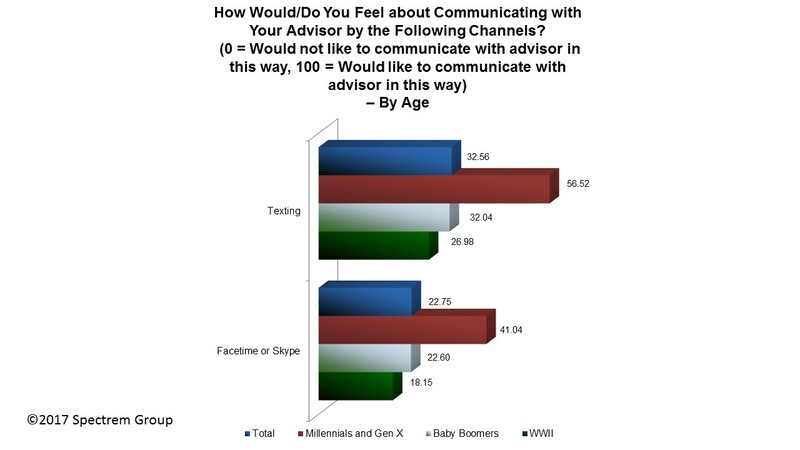 Spectrem’s latest wealth segmentation series study on modern communication Using Social Media and Mobile Technology in Financial Decisions asked investors their favored channel for communicating with their advisor, and phone calls were the most popular choice, followed closely by emails. But 20 percent of Ultra High Net Worth investors with a net worth between $5 million and $25 million have texted their financial advisor, according to the study. That includes 36 percent of UHNW investors under the age of 45 (Millennials and Gen X investors). Even 16 percent of World War II era investors have texted their advisor at some point. Asked if they would like to be able to text their financial advisor, placing their interest on a 0-to-100 scale, UHNW investors put their interest at 32.56, while the Millennials and Gen X investors placed it at 56.52. Perhaps operating on the theory that time is money, the wealthier UHNW investors had a higher regard for the possibility of texting their advisor. Everybody texts, and any attempt by financial providers and advisors to limit texting from investors could affect business. The importance of developing and understanding your company’s compliance guidelines related to texting cannot be overstated. Talk to your clients. Depending on your firm’s attitude towards texting, determine the investor’s interest in using that technology for communication, and let the investor know where limitations exist. Investors need to know what will happen when they text their advisor. Is there a better method of communication the advisor prefers? The value of texting is the immediacy, and investors need to know there is a quick and easy way to contact their advisor.